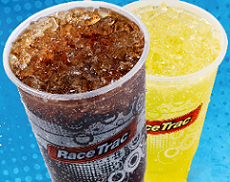 Hurry over to your nearest RaceTrac Store to receive a FREE Fountain Drink! This offer is valid until September 30. One-time use coupon, One coupon per customer, per visit Printed coupon must be presented to cashier. Good at participating RaceTrac location.s No cash value. Expires 9/30/13.